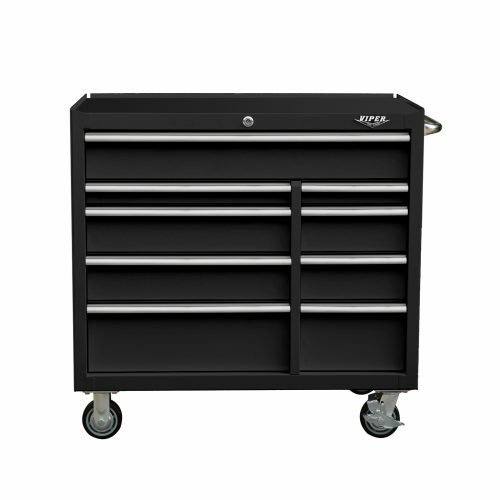 Our 33-Inch 8-Drawer Top Chest with Whiskey Drawer is built to last and will keep your tools secure and organized. The 18-gauge steel frame with corrosion resistant powder coating provides stability. The 7-pin round keyed barrel lock and internal locking system provide an added layer of security while the lid compartment and separately locking whiskey drawer adds storage versatility. This top chest features smooth moving ball bearing drawer slides with a load capacity of up to 100 pounds per drawer. Full length extruded aluminum drawer pulls give you a solid grip. Pre-cut non-slip woven liner is included to cushion your tools and keep them in place while the drawers are in use. Two side bale handles allow you to position this chest to access your tools with convenience. The spacious lid compartment offers additional storage and locks along with the drawers. Two gas struts in the lid allow for controlled motion, and keep it upright when in use. 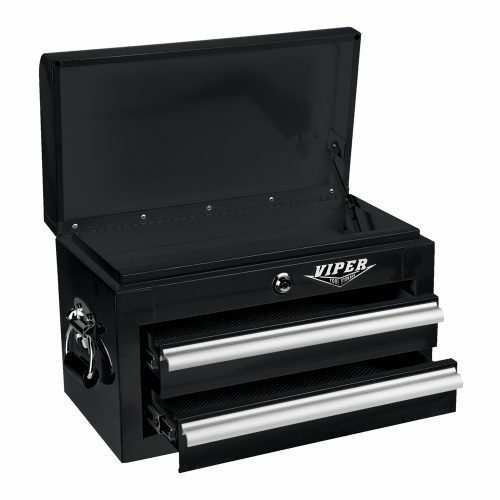 This chest pairs perfectly with the Viper Tool Storage 33-Inch 6-Drawer Rolling Cabinet. FEATURES: THIS 18″ 2-DRAWER MINI TOOL CHEST IS BUILT TOUGH WITH AN 18G STEEL FRAME TO HOLD ITS OWN IN A GARAGE OR SHOP, BUT ITS GLEAMING FINISH WON’T LOOK OUT OF PLACE INSIDE THE HOUSE EITHER. THERE’S PLENTY OF SPACE WITH A STORAGE CAPACITY OF 1,075 CUBIC INCHES. THE DRAWERS HAVE 50-POUND RATED FULL-EXTENSION BALL-BEARING SLIDES AND EXTRUDED ALUMINUM DRAWER PULLS FOR EFFORTLESS ACCESS. STAINLESS STEEL HANDLES ARE FEATURED ON BOTH SIDES FOR EASY PORTABILITY AND THE CAM LOCK WILL ENSURE YOUR STUFF STAYS SECURED WHILE YOU’RE AWAY. BACKED BY A LIMITED LIFETIME WARRANTY. 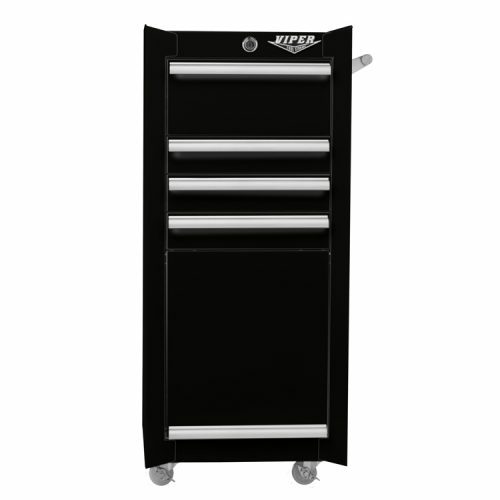 Our Folding Side Shelf with Power Strip attaches to our 16” 4-Drawer Rolling Tool Cart*. Built from sturdy steel, this unique shelf is powder-coated to resist scratches better than standard paint. It fits securely in place when upright, and effortlessly folds down when not in use. 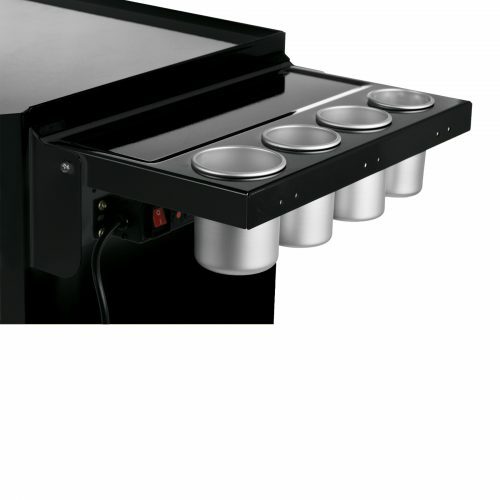 Four multi-sized slots hold removable aluminum cups. A small 15 x 4 inch inset area helps keep small items from rolling off. Four 4-1/4 inch deep aluminum cups come in three sizes: One 3 1/4-inch diameter, two 3-inch diameter, one 2 3/4-inch diameter. The built-in power strip (not a surge protector) includes three 3-prong outlets with a master power switch, and a 9ft power cord. Rated Voltage: 125V 50-60Hz, Max Output Power: 1875W. Looking for your favorite color? Check out our NEW AND IMPROVED Side Shelf with Power Strip and USB Ports!